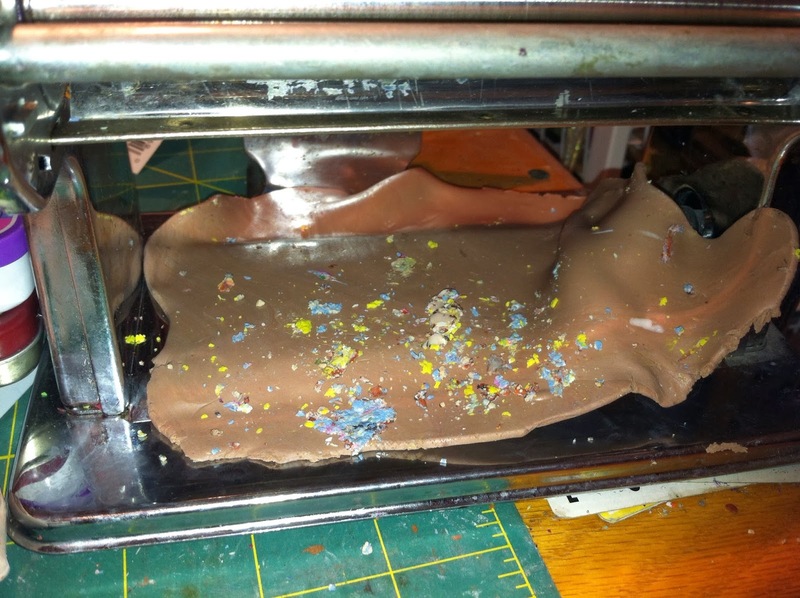 Well it happens, polymer clay gets old and goes stale. When this happens it TAKES FOREVER to condition it, and frankly there are time when it just cannot be done with out some outside assistance. 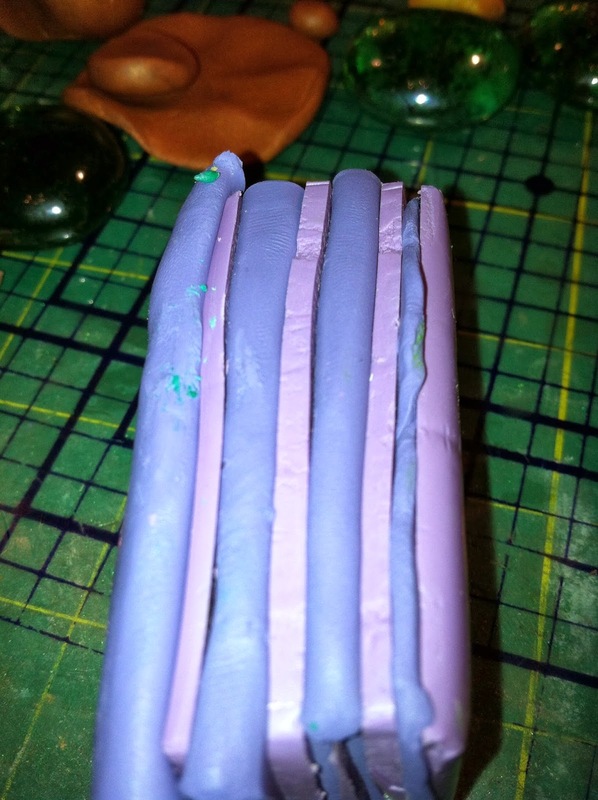 I have a few different ways of dealing with clay when this happens. Standard conditioning isn't working, your hands are getting tired, and running the clay through the pasta machine just crumbles it up more. My first line of defense is the food processor. This little guy works magic, and is also "the bomb" when processing large quantities of clay. 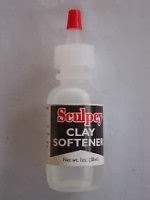 One way that a lot of folks will tell you condition your hard, dried out crumbly clay is to use clay softener. Ok, it works. But be warned: it melts the clay into a softer state, and it canpush it over the edge quickly. 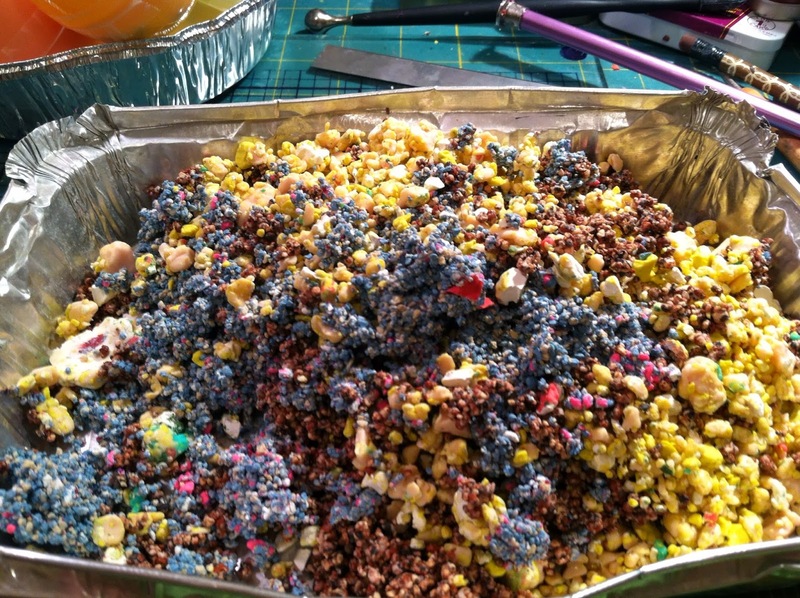 The scene: the clay crumbles, wont stick to its self, forget running it through the pasta machine to smoosh it together, its a mess. You add a drop of softener, nothing happens. You add another 2 drops, and things are starting to show signs of improvement, but still not quite right. You think instead of working this mess more with your hands (getting those little clay particles a bit warm really helps them to become pliable) you decide to add another drop or 3 of softener, then whammy you have a slimy mess on your hands, and now have to figure out what to do with over conditioned clay thats too smooshy to do anything. I have read you can use mineral oil, or baby oil. I haven't tried that yet, so I can't really tell you if its going to work. 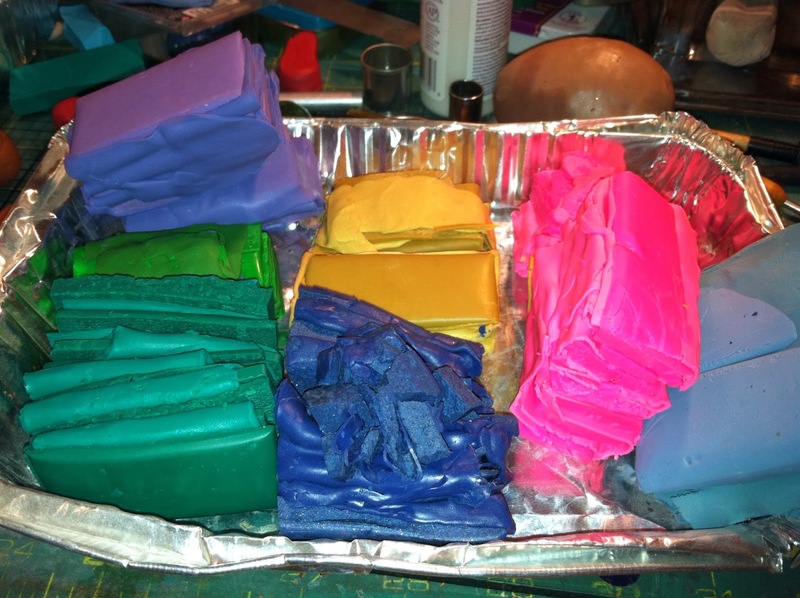 I use a lot of "base clay," clay of whatever color as an under layer for projects. I find that this is the perfect job for old dried out clay. 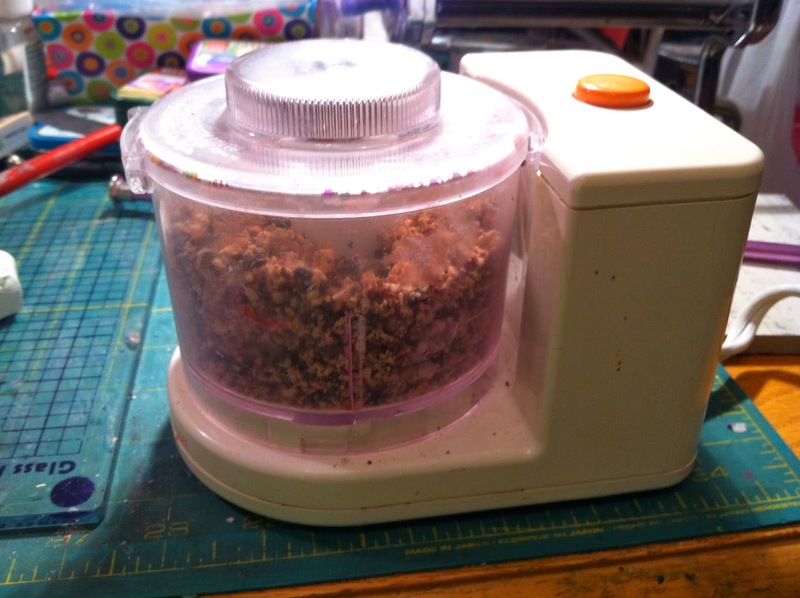 I take the clay, cut it into smallish chuncks and run them through my mini food processor (that I have had for 20+ years, still works great, and is completely dedicated to clay). I mix the colors all up. 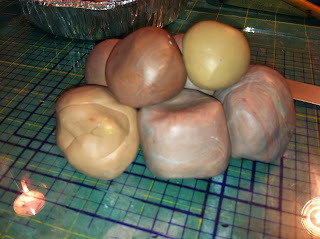 The funky little balls of clay will get every where, but I try to keep track of them. 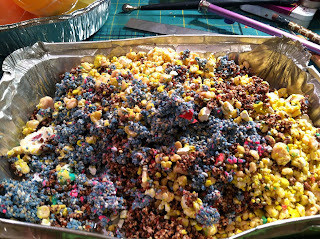 I run this mess through the pasta machine a bazillion times and usually end up with a fairly well mixed color. To catch the bits that fall off when I run it through the pasta machine, I place a piece of well conditioned clay, all rolled out, underneath to "catch" the pesky scraps that fall off. clay lining the bottom of the pasta roller. Prepping stale clay to be conditioned with new clay, while maintaining the color. Ok when color has to be maintained. I take the old hard stuff and layer it with fresh clay or the same/ similar color. 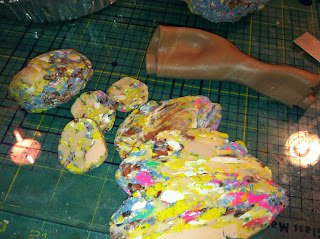 I find this works best if I can layer the old clay with one of the super squishy clays like Fimo Soft or Sculpey III. Let the clays co mingle for a day or too. This lets whatever is in the polymers to sort of transfer back and forth. Then I hand condition it, use the handy little food processor if it needs some help, and of course roll the heck out it with the pasta machine. I know some colors are no longer produced, in those cases I just go with the best match I can find. The chemistry/whats going on here? Im not going to get into al the fancy-dancey names of the compounds that are moving back and forth, because frankly I don't know them and don't care. What ever the plasticizers are in polymer clay that allow it be smooshable they need to be replaced in the old stale/dried out clay. Clay conditioner adds this plasticizer back in. 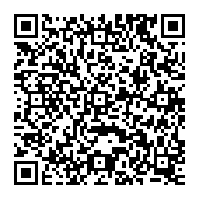 This plasticizer can also come from other clays that still have it. 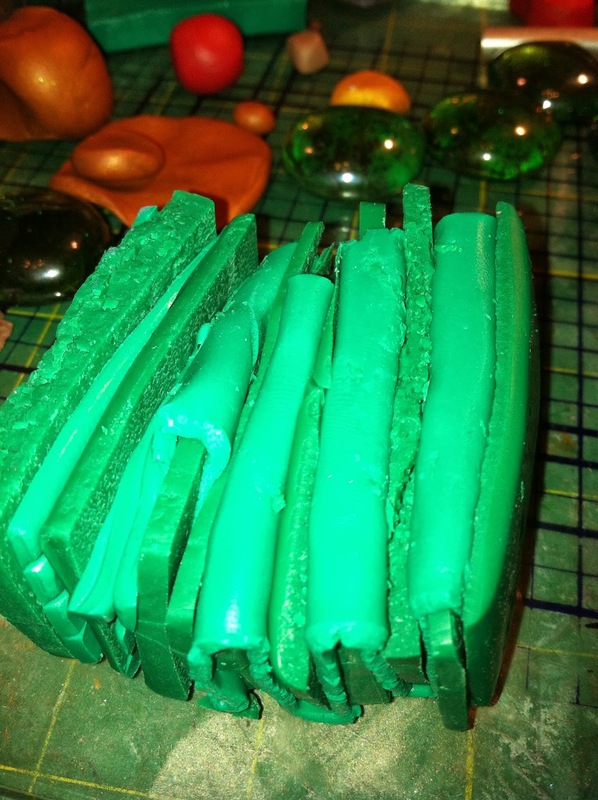 In some clays there is too much of it, and thats why they are super easy to work with with minimal conditioning. Check back next week for part two "My clay is too soft"
Posting lots of new things to the Etsy store!